Dr. Steven T. Colbert DFA has travelled to Baghdad, Iraq to record 4 episodes of his show, The Colbert Report in the domed marble hall of Saddam Hussein's former Al Faw Palace now at the US Military's Camp Victory. The satirical "conservative" pundit wearing a suit fashioned from the US Army's ACU camouflage pattern, declared victory in the war in Iraq. General Ray Odierno, commander of US Forces in Iraq declined to agree, "We're not quite ready to declare victory," he said. "Things are moving forward but again, it's about bringing long-term stability." Colbert, who sat at a desk propped up by sandbags painted to simulate an American flag, responded by asking Odierno if he can bring long-term stability to the United States when he's done in Iraq. 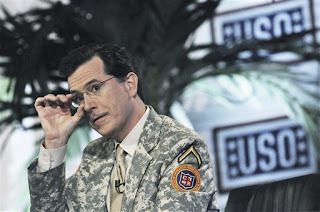 Interestingly, Colbert sought to cast a spotlight on the declining attention paid to the war that has waged since 2003. He has said he was spurred to make the trip when he noticed economic news coverage eclipsing reports from Baghdad. Colbert's arrival in Iraq ended weeks of intense online speculation of just where in the Persian Gulf he was headed after viewers were fed some vague clues in the form of codes randomly appearing on episodes of his late night talk show and even being obviously helped by the master of coded messages himself Lost creator J.J.Abrams. Colbert showed a clip claiming he himself didn't know his destination until he got off the plane and somebody threw a shoe at him. 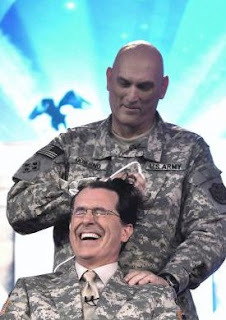 The highlight of the show however was that Gen. Odierno accepted a videotaped order from President Obama and proceeded to shear Colbert's hair off starting with an electric razor and a stylist appearing to finish off his crew-cut. The still not-so-irrelevant former Republican presidential candidate Sen. John McCain also made a video-clip appearance in which he thanked the troops for their service and reminded them to clean their muskets. Celebrities have frequently traveled to Iraq to entertain the troops. But the series of half-hour shows mark the first time anyone has broadcast a taped non-news talk show fully produced and broadcast from Iraq as part of a U.S.O. tour. The show airs this week on Comedy Central Mon-Thu 23:30 /22:30C US Time but sadly has been removed from the current UK schedule and no "officially" available. Visit The Colbert Nation for additional news. He looks handsome in that crazy suit! That photo has got me wondering what poor tailor got the job of making it. Obama did a thing for Conan, too.